InicioIELTSAn introduction to the IELTS listening online test with exercises. 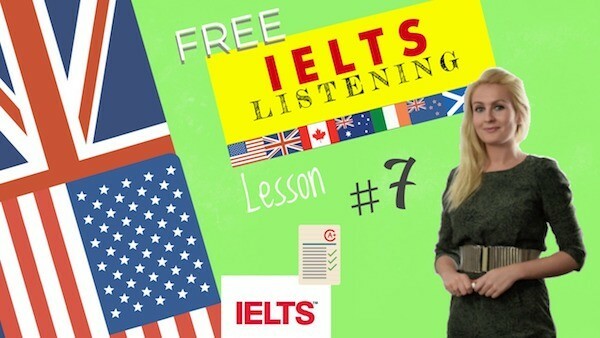 An introduction to the IELTS listening online test with exercises. You will now have 4 listening exercises: 4 videos each followed by 1 quiz and the IELTS listening online test. You’ll hear a number of different recordings and you’ll have to answer questions on what you hear. There will be time for you to read the instructions and questions and you’ll have a chance to check your work. All the recordings will be played once only. The test is in four sections. At the end of the test you’ll be given 10 minutes to transfer your answers to an answer sheet. You’ll hear a young student asking the social organizer of his school for information about organized trips. First you have some time to look at questions 1 to 4. You’ll see that there is an example which has been done for you. On this occasion only the conversation relating to this will be played first. Good morning. How can I help you? there are five trips every month so five has been written in the notes. Now we shall begin. You should answer the questions as you listen because you will not hear the recording a second time. Listen carefully and answer questions 1 to 4. Good morning how can I help you? Yes, we run five every month, three during weekends and two Wednesday afternoon trips . Well, obviously it varies, but always places of historical interest and also which offer a variety of shopping because our students always ask about that. And then we go for ones where we know there are guided tours because this gives a good focus for the visit. Well, we’re lucky here obviously, because we’re able to say that all our visits are less than three hours drive. Again it varies. Between five and fifteen pounds a head. Depending on distance. Oh and we do offer to arrange special trips, if you know there are more than twelve people. Alright, I’ll keep that in mind. And what are the times normally? We try to keep it pretty fixed so that students get to know the pattern. We leave at 8:30 a.m. and return at 6 p.m. We figure it’s best to keep the day fairly short. Oh yes. And how do they reserve a place? You sign your name on the notice board. Do you know where it is? uh-huh, I saw it this morning. And we do ask that you sign up three days in advance so we know we’ve got enough people interested to run it and we can cancel if necessary with full refund of course. Before you hear the rest of the conversation you have some time to look at questions five to ten. Now listen and answer questions 5 to 10. And what visits are planned for this term? Right, well I’m afraid the schedule hasn’t been printed out yet but we have confirmed the dates and planned the optional extra visits which you can also book in advance if you want to. Oh sure. Well the first one is in Ives that’s on the 13th of February and will have only 16 places available, because we going by minibus and that’s a day in town with the optional extra of visiting the Hepworth Museum. Alright yeah that sounds good. Then there’s a London trip on the 16th of February and we’ll be taking a medium-sized coach so there’ll be 45 places on that and let’s see… the optional extra is the Tower of London. Oh I’ve already been there. Yeah after that there’s Bristol on the 3rd of March. That’s in a different minibus with 18 places available oh and the optional extra is a visit to the SS Great Britain. We’re going to Salisbury on the 18th of March and that’s always a popular one, because the optional extra is Stonehenge so we’re taking the large coach with 50 seats. And then the last one is to bath on the 23rd of March. Oh yes, is bath the Roman city? Yes, that’s right and that’s in the 16 seater minibus. And there’s the optional visit? It’s to the American Museum. Well worth a visit. Ok that’s great and thanks all that. My pleasure. Oh by the way, if you want more information about any of the trips have a look in the student newspaper. Or have a word with my assistant. Her name is Janie Yentob. That’s Y-E-N-T-O-B. Alright I’ve got that. Thank you very much for your help. You’re very welcome, I hope you enjoy the trips. That is the end of section 1. You now have half a minute to check your answers. Now turn to section two. Escuchará varias grabaciones diferentes y tendrá que responder preguntas sobre lo que escucha. Habrá tiempo para que lea las instrucciones y preguntas y tendrá la oportunidad de verificar su trabajo. Todas las grabaciones se reproducirán una sola vez. La prueba está en cuatro secciones. Al final de la prueba, le darán 10 minutos para transferir sus respuestas a una hoja de respuestas. Escuchará a un joven estudiante que pregunta al organizador social de su escuela sobre los viajes organizados. Primero tiene tiempo para ver las preguntas 1 a 4. Verá que hay un ejemplo que se ha hecho para usted. Solo en esta ocasión, la conversación relacionada con esto se escuchará primero. Buenos días. ¿Cómo puedo ayudar? hay cinco viajes cada mes, por lo que se han escrito cinco en las notas. Vamos a comenzar. Debe responder las preguntas mientras escucha porque no escuchará la grabación por segunda vez. Escuche atentamente y responda las preguntas 1 a 4. ¿Buenos días cómo puedo ayudarte? Tenemos cinco cada mes, tres durante los fines de semana y los viajes de la tarde del miércoles. Bueno, obviamente varía, pero siempre son lugares de interés histórico y también ofrecen una variedad de compras porque nuestros estudiantes siempre preguntan sobre eso. Y luego vamos a aquellos en los que sabemos que hay visitas guiadas porque esto da un buen enfoque para la visita. Bueno, tenemos suerte aquí, obviamente, porque podemos decir que todas nuestras visitas son menos de tres horas en coche. De nuevo, esto varía. Entre cinco y quince libras por cabeza. Dependiendo de la distancia. Ah, y ofrecemos organizar viajes especiales, si sabes que hay más de doce personas. Vale, lo tendré en cuenta. ¿Y cuáles son los tiempos normalmente? Tratamos de mantenerlo bastante arreglado para que los estudiantes conozcan el patrón. Salimos a las 8h30 y regresamos a las 18h. Creemos que es mejor mantener el día bastante corto. Ah sí. ¿Y cómo reservan un lugar? Usted firma su nombre en el tablón de anuncios. ¿Sabes dónde está? uh-huh, lo vi esta mañana. Y le pedimos que se registre con tres días de anticipación para que sepamos que tenemos suficiente gente interesada para ejecutarlo y podemos cancelarlo si es necesario con un reembolso completo por supuesto. Antes de escuchar el resto de la conversación, tiene tiempo para ver las preguntas cinco a diez. Ahora escuche y conteste las preguntas 5 a 10. ¿Y qué visitas están planeadas para este trimestre? Bien, me temo que el cronograma no se ha impreso aún, pero hemos confirmado las fechas y planeado las visitas adicionales opcionales, que también se pueden reservar con anticipación si se quiere. Oh, eso está bien entonces. Si solo puedes dar una idea de los fines de semana para que pueda, ya sabes cómo salir a ver amigos, etc. Muy bien. Bueno, el primero está en Ives el 13 de febrero y tendrá solo 16 plazas disponibles, porque vamos en minibús y es un día en la ciudad con el extra opcional de visitar el Museo Hepworth. Bien, sí, eso suena bien. Luego hay un viaje a Londres el 16 de febrero y tomaremos un autocar de tamaño mediano, así que habrá 45 lugares en ese y veamos … el extra opcional es la Torre de Londres. Oh, ya he estado allí. Sí, después de eso está Bristol el 3 de marzo. Eso en un microbús diferente con 18 sitios disponibles ah y el extra opcional es una visita al SS Great Britain. Vamos a Salisbury el 18 de marzo y eso siempre es popular, porque el extra opcional es Stonehenge, así que tomamos el gran autocar con 50 asientos. Y luego el último es Bath el 23 de marzo. Oh, sí, ¿Bath es la ciudad romana? Sí, eso es correcto y eso es en el minibús de 16 plazas. ¿Y está la visita opcional? Es para el Museo Americano. Digno de una visita. Ok eso es genial y gracias por todo. Ha sido un placer. Ah, por cierto, si desea obtener más información sobre cualquiera de los viajes, eche un vistazo al periódico estudiantil. O hable unos minutos con mi asistente. Su nombre es Janie Yentob. Es Y-E-N-T-O-B. Está bien, lo tengo. Muchas gracias por su ayuda. De nada, espero que disfrutes los viajes. Ese es el final de la sección 1. Ahora tiene medio minuto para verificar sus respuestas. Ahora pase a la sección dos. You’ll hear a tour guide giving a talk about a museum center called Riverside industrial village. First you have some time to look at questions 11 to 13. Now listen carefully and answer questions 11 to 13. Good afternoon everybody and welcome to Riverside industrial village. To start your visit I’m just going to give you a brief account of the history of the museum before letting you roam about on your own. I won’t keep you long okay? Now from where we’re standing you’ve got a good view of the river over there. And it was because of this fast flowing water that this site was a natural place for manufacturing works. The water and the availability of raw materials in the area like minerals and iron, ore and also the abundance of local fuels like coal and firewood, all made this site suitable for industry from a very early time. Water was the main source of power for the early industries and some of the water wheels were first established in the 12th century, would you believe? At that time local craftsmen first built an iron Forge just behind the village here on the bend in the river. By the 17th and 18th centuries the region’s rivers supported more than a hundred and sixty water mills and many of these continued to operate well into the nineteenth century. But then, the steam engine was invented and then the railways came and the centres of industry were able to move away from the rivers and the countryside and into the towns. So industrial villages like this one became very rare. So that’s the history for you. If you’d like any more information you can ask me some questions or you can read further in our excellent guidebook. Before you hear the rest of the talk you have some time to look at questions 14 to 20. Now listen and answer questions 14 to 20. That is the end of section 2. You now have half a minute to check your answers. Now turn to section three. Escuchará a un guía turístico que dará una charla sobre un centro de museos llamado Riverside industrial village. Primero tiene tiempo para ver las preguntas 11 a 13. Ahora escuche atentamente y responda las preguntas 11 a 13. Buenas tardes a todos y bienvenidos al pueblo industrial de Riverside. Para comenzar su visita, le voy a dar un breve resumen de la historia del museo antes de dejarlo deambular por su cuenta. No les detengo mucho ¿de acuerdo? Ahora desde donde estamos parados tenemos una buena vista del río allá. Y fue por este agua de flujo rápido por el que este sitio era un lugar natural para las obras de fabricación. El agua y la disponibilidad de materias primas en el área como los minerales y el hierro, el mineral y también la abundancia de combustibles locales como el carbón y la leña, todo esto hizo que este sitio fuera adecuado para la industria desde un tiempo muy temprano. El agua era la principal fuente de energía para las primeras industrias y algunas de las ruedas hidráulicas se establecieron por primera vez en el siglo XII, ¿no cree? En ese momento, los artesanos locales construyeron una Forja de hierro justo detrás del pueblo, aquí en la curva del río. En los siglos XVII y XVIII, los ríos de la región albergaban más de ciento sesenta molinos de agua y muchos de ellos continuaron funcionando hasta bien entrado el siglo XIX. Pero luego, la máquina de vapor fue inventada y luego vinieron los ferrocarriles y los centros industriales pudieron alejarse de los ríos, el campo y las ciudades. Así que las aldeas industriales como esta se volvieron muy raras. Entonces esa es la historia Si desea más información, puede hacerme algunas preguntas o puede leer más en nuestra excelente guía. Antes de escuchar el resto de la charla, tiene tiempo para ver las preguntas 14 a 20. Ahora escuche y responda las preguntas 14 a 20. Ese es el final de la sección 2. Ahora tiene medio minuto para verificar sus respuestas. Ahora pasa a la sección tres. You’ll hear Melanie a student talking to one of her lecturers about her studies. First you have some time to look at questions 21 to 27. Now listen carefully and answer questions 21 to 27. Excuse me dr. Johnson. May I speak to you for a minute? I’m Melanie Griffin. I’m taking your course in population studies. Right well, Melanie how can I help you? I’m having a bit of trouble with a second assignment and it’s due in 12 days. What sort of trouble are you having? Is the assignment question a problem? Well that’s part of the problem. I’m also having… I’ve been having trouble getting hold of the books. I’ve been to the library several times and all the books are out. You might get an extension of time to finish your assignment for me. Well yes, it is possible, but extensions are normally given only for medical or compassionate reasons. Otherwise it’s really a question of organizing your study and we don’t like giving extensions to students who simply didn’t plan their work properly. What did you get for your first assignment? Mmm yes, you did very well indeed. So obviously you can produce good work. I don’t think I’ll need too much extra time as long as I can get hold of some of the important references. Well since you did so well in your first assignment, I’m prepared to give you an extra two weeks for this one. So that’ll mean you’ll need to submit it about a month from now. Now, what about the reading materials, have you checked out the journal articles in the list? Um no not yet. There were about 20 of them and I wasn’t sure which ones would be most useful or important. Well they’re all useful, but I don’t expect anyone to read them all, because a number of them deal with the same issues. Let me give you some suggestions. The article by Anderson and Hawker is really worth reading. Right, I’ll read that one. You should. Also read the article by Jackson, but just look at the part in the research methodology, how they did it. And if you have time, the one by Roberts says very relevant things. Although, it’s not essential. So okay, if it’s useful I’ll try and read that one now. The one by Morris I wouldn’t bother with that at this stage if I were you. Okay I won’t bother with Morris. Oh now someone told me the article by Cooper is important. Well yes, in a way. But just look at the last part where he discusses the research results. And lastly there’s Forrester. I can’t think why I included that one. It’s not bad and could be of some help but not that much. Before you hear the rest of the conversation you have some time to look at questions 28 to 30. Now listen and answer questions 28 to 30. Now let’s deal with the assignment question. What’s the problem there? It’s the graph on page 2. What seems to be the problem? It’s just the bar graph showing reasons why people change where they live. Well I’ve got a photocopy but the reasons at the bottom are missing. Ah ok. Look at the first bar on the graph. Now that indicates the number of people who move because they want more space. Oh I see. One… okay now, what about the next bar? Bar two is to do with the people living nearby, disturbing them so they chose to move away to somewhere quieter. Now let’s look at bar number three another reason people change their place of living is because they want to be closer to the city. Okay, proximity to the city is an issue. Now bar number four refers to problems when the owner of the property won’t help fix things that go wrong. In other words the owner is not helpful and so the tenants move out. Okay now, what about bar five? Bar five is about those people who move, because they need a bus or train to get them into the city or to go to work. Bar number six is interesting. That reason was given quite a lot people moving because they wanted to be in a more attractive neighborhood. Oh yes, thank you very much. That is the end of section 3. You now have half a minute to check your answers. Now turn to section 4. Escuchará a Melanie, una estudiante hablando con uno de sus profesores sobre sus estudios. Primero, tiene tiempo para ver las preguntas 21 a 27. Ahora escuche atentamente y responda las preguntas 21 a 27. Disculpe Dr. Johnson. ¿Puedo hablar con usted por un minuto? Soy Melanie Griffin. Estoy tomando su curso de estudios de población. Bien, Melanie, ¿cómo puedo ayudarle? Estoy teniendo problemas con una segunda tarea y vence en 12 días. ¿Qué clase de problema tiene? ¿La pregunta de los deberes es un problema? Bueno, eso es parte del problema. También estoy teniendo… He estado teniendo problemas para conseguir los libros. He estado en la biblioteca varias veces y no queda ninguno de los libros. Puede obtener una extensión de tiempo para terminar su tarea. Bueno, sí, es posible, pero las extensiones normalmente se otorgan solo por razones médicas o de compasión. De lo contrario, es realmente una cuestión de organizar su estudio y no nos gusta dar extensiones a los estudiantes que simplemente no planificaron su trabajo correctamente. ¿Qué nota obtuvo en su primera tarea? Mmm sí, lo hizo muy bien de hecho. Entonces, obviamente, puede realizar un buen trabajo. No creo que necesite demasiado tiempo extra siempre que pueda obtener algunas de las referencias importantes. Bueno, ya que lo hizo tan bien en su primera tarea, estoy dispuesto a darle un extra de dos semanas para esta. Entonces eso significará que deberá enviarlo dentro de un mes a partir de ahora. Ahora, ¿qué pasa con los materiales de lectura, ha revisado los artículos de revistas de la lista? Um no todavía. Había alrededor de 20 de ellos y no estaba segura de cuáles serían los más útiles o importantes. Bueno, todos son útiles, pero no espero que nadie los lea todos, porque varios de ellos lidian con los mismos problemas. Déjeme darle algunas sugerencias. El artículo de Anderson y Hawker realmente vale la pena leerlo. Debería. También lea el artículo de Jackson, pero solo mire la parte de la metodología de investigación, cómo lo hicieron. De acuerdo, Jackson… lo tengo apuntado. Y si tiene tiempo, el de Roberts dice cosas muy relevantes. Aunque, no es esencial. De acuerdo, si es útil, intentaré leerlo ahora. El de Morris. No me molestaría con él en esta etapa si fuera usted. De acuerdo, no me molestaré con Morris. Oh, ahora alguien me dijo que el artículo de Cooper es importante. Bueno, sí, en cierto modo. Pero solo mire la última parte donde discute los resultados de la investigación. Y finalmente está Forrester. No puedo pensar por qué lo incluí. No está mal y podría ser de alguna ayuda, pero no tanto. Antes de escuchar el resto de la conversación, tiene tiempo para ver las preguntas 28 a 30. Ahora escuche y conteste las preguntas 28 a 30. Ahora veamos la cuestión de la tarea. ¿Cuál es el problema allí? Es el gráfico en la página 2. ¿Cuál parece ser el problema? Es solo el gráfico de barras que muestra las razones por las cuales las personas cambian su lugar de residencia. Bueno, tengo una fotocopia pero faltan las razones en la parte inferior. Ah, ok. Mira la primera barra en el gráfico. Esa indica la cantidad de personas que se mudan porque quieren más espacio. Ah, ya veo. Uno… está bien, ¿y el próximo gráfico de barras? El segundo tiene que ver con la gente que vive cerca molestándolos, así que eligen mudarse a un lugar más tranquilo. Ahora veamos el número tres, otra razón por la cual las personas cambian su lugar de vida es porque quieren estar más cerca de la ciudad. De acuerdo, la proximidad a la ciudad es un problema. Ahora, el número cuatro se refiere a problemas cuando el dueño de la propiedad no ayuda a arreglar las cosas que fallan. En otras palabras, el propietario no es útil y los inquilinos se mudan. De acuerdo, ¿y el gráfico de barras número cinco? El gráfico de barras número cinco se trata de las personas que se mudan porque necesitan un autobús o un tren para llevarlos a la ciudad o para ir a trabajar. ¿De acuerdo y el gráfico de barras número seis? El número seis es interesante. A esa razónfue impotante para que se mudara mucha gente porque querían estar en un vecindario más atractivo. Ese es el final de la sección 3. Ahora tiene medio minuto para verificar sus respuestas. Ahora pase a la sección 4. You’ll hear a talk on the subject of the urban landscape. First you have some time to look at questions 31 to 40. Now listen carefully and answer questions 31 to 40. Good day ladies and gentlemen. I have been asked today to talk to you about the urban landscape. There are two major areas that I will focus on in my talk. How vegetation can have a significant effect on urban climate and how we can better plan our cities using trees to provide a more comfortable environment for us to live in. Trees can have a significant impact on our cities. They can make a city as a whole a bit less windy or a bit more windy, if that’s what you want. They can make it a bit cooler if it’s a hot summer day in an Australian city, or they can make it a bit more humid if it’s a dry, inland city. On the local scale, that is in particular areas within the city, trees can make the local area more shady, cooler, more humid, and much less windy. In fact trees and planting of various kinds can be used to make city streets actually less dangerous in particular areas. How do trees do that, you ask? Well the main difference between a tree and a building is a tree has got an internal mechanism to keep the temperature regulated. It evaporates water through its leaves and that means that the temperature of the leaves is never very far from our own body temperature. The temperature of a building surface on a hot sunny day can easily be 20 degrees more than our temperature. Trees on the other hand remain cooler than buildings because they sweat. This means that they can humidify the air and cool it. A property which can be exploited to improve the local climate. Trees also help break the force of winds. The reason that high buildings make it windier at ground level is that as the wind goes higher and higher it goes faster and faster. When the wind hits the building it has to go somewhere. Some of it goes over the top and some goes around the sides of the building forcing those high level winds down to ground level. That doesn’t happen when you have trees. Trees filter the wind and considerably reduce it preventing those very large strong gusts that you so often find around tall buildings. Another problem in built-up areas is that traffic noise is intensified by tall buildings. By planting a belt of trees at the side of the road you can make things a little quieter but much of the vehicle noise still goes through the trees. Trees can also help reduce the amount of noise in the surroundings although the effect is not as large as people like to think. Low-frequency noise in particular just goes through the trees as though they aren’t there. Although, trees can significantly improve the local climate. They do however, take up a lot of space. There are root systems to consider and branches blocking windows and so on. It may therefore be difficult to fit trees into the local landscape. There is not a great deal you can do if you have what we call a Street Canyon – a whole set of high-rises enclosed in a narrow street. Trees need water to grow. They also need some sunlight to grow. And you need room to put them. If you have the chance of knocking buildings down and replacing them then suddenly you can start looking at different ways to design the streets. That is the end of section 4. Now have half a minute to check your answers. That is the end of the listening test. In the IELTS test you would now have ten minutes to transfer your answers to the listening answer sheet. Escuchará una charla sobre el tema del paisaje urbano. Primero tiene tiempo para mirar las preguntas 31 a 40. Ahora escuche atentamente y responda las preguntas 31 a 40. Buenos días, damas y caballeros. Me han pedido hoy que les hable sobre el paisaje urbano. Hay dos áreas principales en las que me concentraré en mi charla. Cómo la vegetación puede tener un efecto significativo en el clima urbano y cómo podemos planificar mejor nuestras ciudades usando árboles para proporcionar un ambiente más cómodo en el que vivir. Los árboles pueden tener un impacto significativo en nuestras ciudades. Pueden hacer que una ciudad en conjunto tenga menos viento o un poco más de viento, si eso es lo que quieres. Pueden hacer que sea un poco más fresco si es un caluroso día de verano en una ciudad australiana, o pueden hacer que sea un poco más húmedo si es una ciudad seca y tierra adentro. En la escala local, es decir, en áreas específicas dentro de la ciudad, los árboles pueden hacer que el área local sea más sombría, más fresca, más húmeda y con mucho menos viento. De hecho, los árboles y la plantación de diversos tipos se pueden utilizar para hacer las calles de la ciudad realmente menos peligrosas en áreas particulares. ¿Cómo hacen esto los árboles, preguntas? Bueno, la principal diferencia entre un árbol y un edificio es que un árbol tiene un mecanismo interno para mantener la temperatura regulada. Se evapora el agua a través de sus hojas y eso significa que la temperatura de las hojas nunca está muy lejos de la temperatura de nuestro propio cuerpo. La temperatura de la superficie de un edificio en un día caluroso y soleado puede ser fácilmente 20 grados más que nuestra temperatura. Los árboles, por otro lado, permanecen más fríos que los edificios porque sudan. Esto significa que pueden humidificar el aire y enfriarlo. Una propiedad que puede ser explotada para mejorar el clima local. Los árboles también ayudan a romper la fuerza de los vientos. La razón por la cual los edificios altos lo hacen más ventoso a nivel del suelo es que a medida que el viento sube más y más, va cada vez más rápido. Cuando el viento golpea el edificio tiene que ir a alguna parte. Parte de ella pasa por encima y parte de los lados del edificio obliga a esos vientos de alto nivel a bajar al nivel del suelo. Eso no ocurre cuando tienes árboles. Los árboles filtran el viento y lo reducen considerablemente, impidiendo esas grandes ráfagas muy fuertes que con tanta frecuencia se encuentran alrededor de edificios altos. Otro problema en las áreas urbanizadas es que el ruido del tráfico se intensifica por los edificios altos. Al plantar un cinturón de árboles al costado de la carretera, puede hacer las cosas un poco más silenciosas, pero gran parte del ruido del vehículo todavía pasa entre los árboles. Los árboles también pueden ayudar a reducir la cantidad de ruido en el entorno, aunque el efecto no es tan grande como a la gente le gusta pensar. El ruido de baja frecuencia, en particular, solo atraviesa los árboles como si no estuvieran allí. Aunque, los árboles pueden mejorar significativamente el clima local. Sin embargo, ocupan mucho espacio. Hay sistemas de raíces a considerar y ramas que bloquean ventanas, etc. Por lo tanto, puede ser difícil colocar árboles en el paisaje local. No hay mucho que pueda hacer si tiene lo que llamamos una Calle Cañon: un conjunto completo de edificios altos encerrados en una calle estrecha. Los árboles necesitan agua para crecer. También necesitan un poco de luz solar para crecer. Y necesitas espacio para ponerlos. Si tienes la posibilidad de derribar edificios y reemplazarlos, de repente puedes comenzar a buscar diferentes formas de diseñar las calles. Ese es el final de la sección 4. Ahora tiene medio minuto para verificar sus respuestas. Ese es el final de la prueba de escucha. En la prueba IELTS ahora tendría diez minutos para transferir sus respuestas a la hoja de respuestas de escucha. Do check out some ielts listening online test passages!